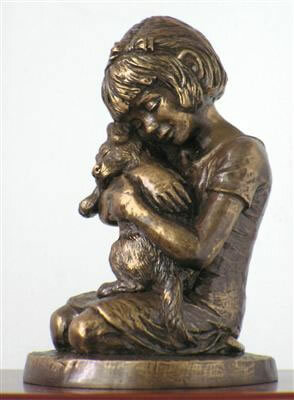 A heartfelt bronze cold cast resin sculpture, the "Best Friend" pet urn evokes memories of love and companionship. The sculpture has the look and feel of bronze, but is cold cast in an affordable designer resin and sits atop a hardwood urn available in your choice of cherry, oak, or walnut finish. The base of the urn is attached with four screws for easy loading. A 5"W x 3.5"H magnetized photo frame for the Large Urn or a 2"W x 3"H magnetized photo frame for the Small Urn can be purchased for an additional fee. An optional engraved name plate is available. Please limit engraving to no more than about 20-25 spaces per line. 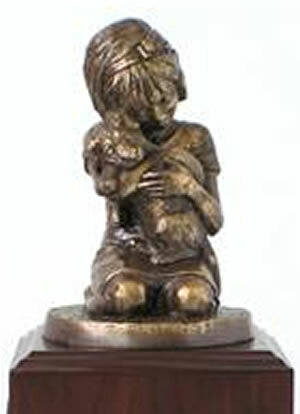 Large: 13.5"H x 6.5"D x 6.5"W - 110 cubic inches (large enough for MOST pets weighing up to 70 lbs). 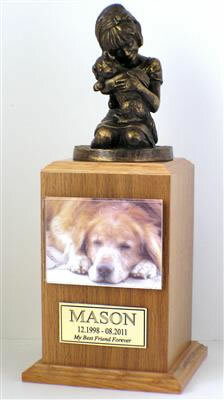 Dimensions of just the large wood urn are 8.75" x 6.25" x 6.25"
There is no standard for determining size of pet cremains. Becasue of the variations in cremation processing for pets we generally advise 1 pound of HEALTHY pet weight = 1.5-2 cubic inches, especially for smaller pets. If you have the ashes you can measure the bag by making it into a square and multiplying the length x width x height. That will give you the cubic inches. For instance a box that is 4"L x 4"W x 5" H = 80 cubic inches. Weight is dimensional weight calculated for expedited shipping costs. Please allow 1-2 business days before urn ships. Ships from the Midwest.